This week I was wrapping up the vehicles for my post apoc collection. That is not to say I won’t find another one I just have to have before the project is done, but for now just about all of them are complete… one exception is the Oscar Mayer Wienermobile I am thinking about including. Anyway, in terms of the Weekly Workbench, my focus this week was on finishing my Dimestore Dreams vehicles: a woody and trailer, a convertible, another taxi, a fire chief’s car and a military signal corps’ van. Not all of these will actually be used, but since I have them I decided to get them done. The woody, trailer and convertible were complete repaints. The taxi, fire chief’s car and signals van are done in my limited paint job method. Once they were complete I decided to move on to my not-Ghostbusters/Paranormal Exterminators car from Crooked Dice. Mine will have one very distinct difference from the traditional Ghostbusters look. 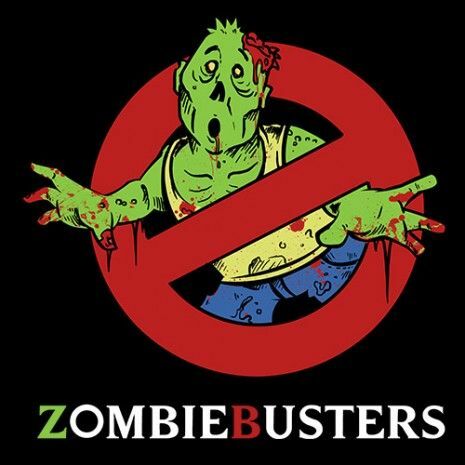 Instead of the traditional Ghostbusters’ emblem on the doors, my car will have a similar emblem but with a zombie rather than a ghost in the circle. We’re working on the homemade decals now. The last group of vehicles worked on this week is the wrecks for my junkyard. Over the years, if I found a nice busted-up car for about 50 cents, I purchased it with the idea of including it in my junkyard. I did seven of them this week. I’m pretty happy with them. The last focus for the workbench this week was vultures. Within the last year or so, Reaper released a pack of really nice vultures (3 different poses/six vultures per pack). I posed three of them on the stone block I cut from Molly Hayes, and have them surrounding a bloody body. I use a fourth vulture on one of the telephone poles that will be lining the road through the desert. Pretty good week. This past week the Weekly Workbench has once again been mainly dedicated to vehicles. If I have my count correct, I did 19 vehicles this week including a couple motorboats on trailers by Dimestore Dreams. I did several Dimestore Dreams’ plastic vehicles this week, but most of the cars and trucks painted this week are die cast. Most of the die cast pieces I finished this week were completely repainted, but several received the limited paint job focused on chrome, windows, wheels and an overall spray with Testors Dullcote. I painted up a couple more 1949 Ford police cars. While these are slightly different from the one I did last week, they seem to be based on the same toy body. I added large antenna to both using wire and beads. Since these police cars were Louisiana police vehicles painted overall white with the state map as the emblem on the door, I painted them to match the previous black and white, and I will be adding a homemade decal of the California Highway Patrol badge to the doors. In addition to the vehicle work I did this week, I painted some giant one-eyed worms made from plastic eye stalks originally attached to head bands much like those that are used with Minnie Mouse ears at Disneyland. I got the eye-stalk head bands at the swap meet for 50 cents each. I cut the eye-stalks from the head bands and set them in a Milliput base decorated with small stones. Once the bases were hardened I gave each piece a new paint job. They’re a little crazy, but they look pretty good. My final work this past week was painting two Wyrd Miniatures’ Malifaux children that I picked up at Brookhurst Hobbies’ Bring and Buy last week. I paid $2 each for the figures which isn’t bad for Malifaux figures that tend to be very expensive. The little girl has a kind of Adams’ family look to her though I did her as a blond, and as for the baby and his teddy, well, who doesn’t love a baby and his teddy. This has been another week of vehicles for my post apoc collection. Most of the vehicles are die cast vehicles that I picked up for $3 or less at the swap meet, but there are a few unique pieces. The most unique is a resin Zamboni I bought in a Montreal gift shop in 2015. While the original is a little on the tongue-in-cheek side, particularly the overstuffed chair as the driver’s seat, I couldn’t resist it. The Zamboni just had too much potential for my post apoc world. I decided to leave most of the Zamboni unmodified and with its original paint, and I focused my attention on the driver’s cockpit… raised the floor using Legos, provided a new bench seat set on the cushion of the overstuff chair, added a steering wheel, and attached some barrels to distract from the overstuffed chair. Finally I gave it a driver from the West Wind Road Kill Human Biker Gang pack. Another unusual piece is the Toot Toy eight-wheel tractor-trailer. It’s another swap meet find and while more toy-like than most of my die cast vehicles it seemed a reasonable match for the post apoc collection. I also worked on a Dime Store Dreams’ plastic police car. I really like the Dime Store Dreams vehicles, and in the case of the police car I decided to do only limited targeted painting… siren, red roof light, grill, windows, and wheels. I left the rest of the police car as it came and sprayed it with Testors Dullcote to give it the flat look of my fully painted vehicles. I took that same approach with my 1949 Ford and 1957 Chevy police cars, the hot rod with yellow flames, and my school bus. Other than the Zamboni’s driver, the only figure I painted this week was another Great Worm by Reaper Bones. I cut out a section of about a third of its body to give it a different look from the original and then painted it. I photographed it next to the first Great Worm I did/the original version to show the size difference. Pretty productive week. This week my workbench continued its focus on vehicles for my post apoc collection. I completed modification and painting of nine vehicles that included an armored VW bus and Chevy stationwagon, a tourist van, a trash truck and several die cast pieces. All of the vehicles I worked on this week were obtained at the swap meet… most for a dollar and none for more than three dollars. The armored vehicles were modified with the use of Evergreen Plastic and detailed with barrels, jerry cans, and bedrolls by Tamiya. The tourist van also includes a large tarp covering Legos. The tarp is made from Kleenex coated with Testor’s dullcote paint. The tourist van, the VW bus, the armored Chevy and the trash truck all have personnel from West Wind’s Road Kill Human Biker Gang. When I painted up the West Wind motorcycles without their riders, I was left with ten bikers that I was wanted to find good use for. The biker sitting on the rear opening of the trash truck is the most interesting in that he is removable… held in place by two tiny magnets much the same as those I used to hold the removable boards over some of my town windows. All in all, not a bad week’s work. Postscript: I’ve decided to cheat a little and stick in a couple pictures of my Zombie Abatement Team (Z.A.T.) bus. It’s the first zombie-related item I have ever done, and it was completed perhaps eight or ten years ago when I first got the idea of doing a post apoc zombie desert community. Like most of the vehicles in this collection, it was picked up for a dollar at the swap meet. The reason I’m tucking it in here is that I want a record of all the vehicles I’m doing for this project, and because this one was done so long ago it won’t fit in the normal postings on the Weekly Workbench. Also, it’s my website so I can do what I want.